In medium bowl, stir milk, Bisquick mix, peanut butter, granulated sugar, vanilla and egg until well blended. Carefully dip bread into batter on both sides. Place in waffle iron; close lid. Bake about 2 minutes or until steaming stops and "toast" is golden. Carefully remove waffle toast. 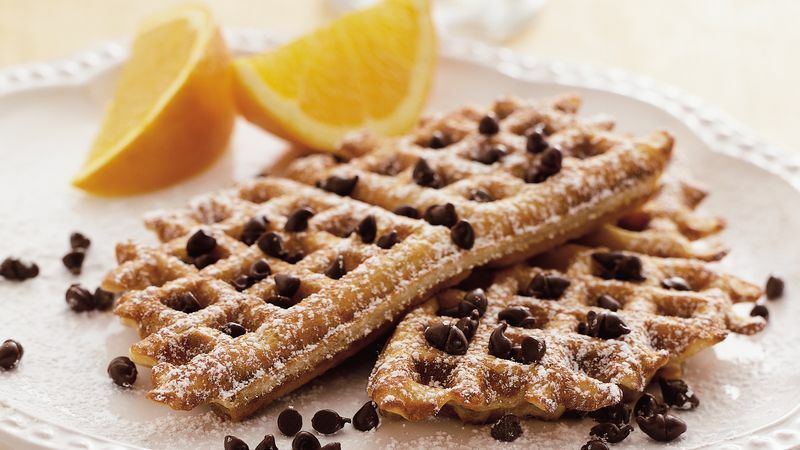 Sprinkle each waffle with 1 tablespoon chocolate chips and powdered sugar. The peanutty batter covering the bread is thick so it clings to the bread. If it seems a little too thick, add a small amount of milk. When you coat the bread, use your fingers to turn the slices (messy) or try using a spatula (less messy). Either way, the toast turns out delicious! How many slices of waffle toast you'll actually make will depend on the type of bread you use.